4245, Jalan Heng Choon Thian,12000 Butterworth, Penang, Malaysia. 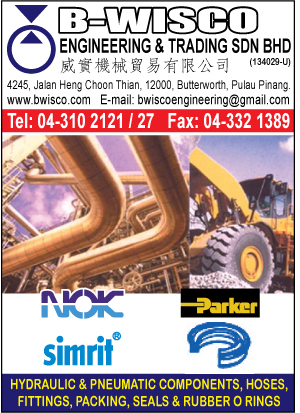 B-Wisco Engineering & Trading Sdn Bhd, incorporated in 2000, engages exclusively in all types of hose coupling and fittings, hydraulic seals, seal-o-rings, pneumatic fittings, shaft seals and other engineering feats. Brand Parker, Goodyear Industrial Hoses, Eriks Seals, NOK Oil Seals and many more brands are part of our branding range. We have been supplying established brands – know as a trusted and reliable partner and supplier by both our principals and clients.